Our little O is becoming such a big girl! We recently mastered potty training and with that came the “big girl bed”… er, um… toddler bed. While potty training we assembled her hand-me-down big girl bed and tossed it in her room. The glider got squished to the left and the dresser was forced further under the window. It stayed like this for a few weeks. We used the promise of a big girl bed to motivate O to have “dry days” and she was thrilled at the thought of being a big girl! Oh the mess! And it was feeling cramped to say the least. I knew a clean out and overhaul was necessary. Oh. So. Necessary. We ditched the glider. As much as I loved rocking O, she had outgrown rocking and the chair was beginning to rock laundry instead. I also worried about that tall bookcase on the end of the room. I had arranged it that way for a humidifier and so that we could keep things out of reach. Though O is not a climber, we knew that if she really wanted something she could definitely attempt to climb and get it. Plus, she loves her books and having them all at her level was appealing. We decided the move the shelving unit under the window and turn it on it’s side to become a long bookcase that could also serve the purpose of a night stand. The cubbie style unit is from Target. I chose it knowing that we could move it to virtually any room because it was so easy to change. O needs a place to keep her glasses so that she can access them when she gets up. We’ve left the crib in the room for a few reasons:1-It was a total pain to assemble and I’m never doing it again; 2- We’d love to have a use for it in the future (no, nothing is currently in the works… but these yoga pants aren’t flattering anyway); 3-It was a total pain to assemble and I’m never doing it again… Like assembling it really tested our relationship. haha! The dresser stayed centered under the other window and we jut moved the lamps to more functional locations. 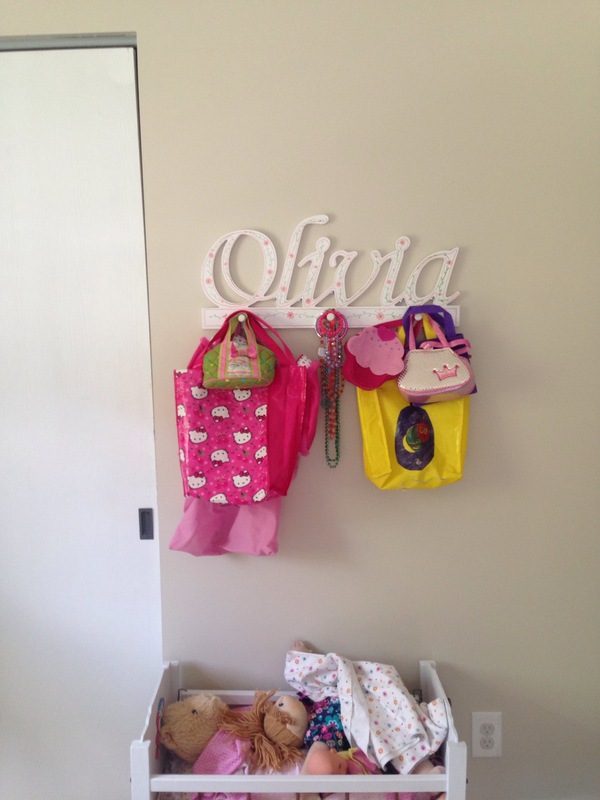 After we moved everything, we were able to make a little spot for baby dolls and finally hang O’s pegs and put them to use. This kid has nearly as many bags and jewelry as I do! 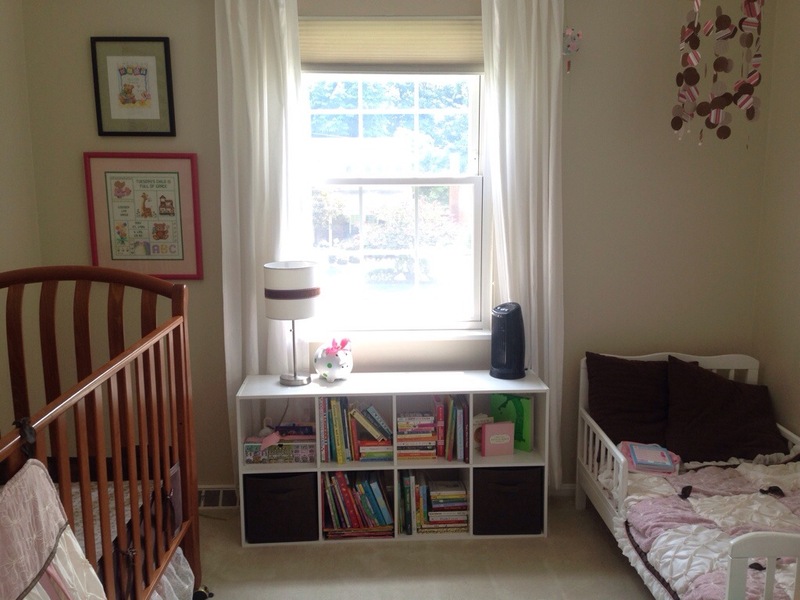 Her room feels fresher, a little more spacious and functional. It also feels a little more grown up! PSSST! You can see an original post about O’s room here. Oh. Sweet O and Diva-Mommie!! 🙂 The world is your treasure! Love every moment and enjoy!!! I’m loving and enjoying it, too!! I am soooo proud to be your Grammy–AND–Great Grammy!! Love you so much!!!! !